®. We have more than 50 class-A musky lakes around Boulder Junction, so this has long been a place to go after the big one. The first reference to Boulder Junction as the “Musky Capital of the World” was made by a Chicago sportswriter who fished here in the 1930s. The name has been used regularly to promote the area since 1942, and the U.S. Patent Office awarded Boulder Junction the trademark to use the name in 1971. 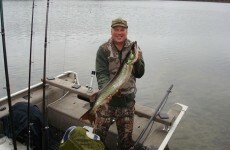 Our hometown fish is no small fry – the Wisconsin record musky weighed nearly 70 pounds and was 63.5 inches long. Check of this fun infographic to learn more about our famous fish. You won’t have to look hard to find a great fishing lake in Boulder Junction. We have a huge number of lakes – you’ll find 194 in and around Boulder Junction. That gives anglers a variety of options, from small, undeveloped lakes to the 3,800-acre Trout Lake. Here are some details on a few of our more popular lakes. Our retailers have all the gear you need to get on the water. 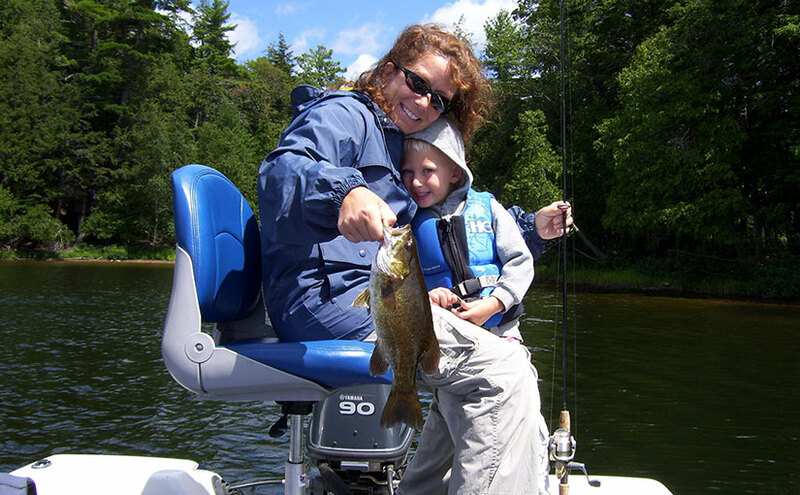 Head to Northern Highland Sports for fishing gear, lake maps, bait and more. Coontail is another good bet for clothing and supplies to keep you comfortable on the water. Here’s the secret to catching the biggest fish in Boulder Junction: find someone with the secrets. Our fishing guides have decades of experience on the water and they can provide a lot of valuable insight to beginners and veterans alike. They also take care of all the logistics, so you can arrive in Boulder Junction ready to do what you came here for – catch some fish! 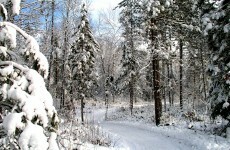 For generations, Boulder Junction has been a premier Northwoods fishing destination. We have it all – an abundance of beautiful and productive waters, ample lodging, expert fishing guides and amenities to support any fishing expedition and any budget. Our lakes are waiting: make plans to spend some time on our lakes this year. Here’s a quick guide to fishing in Boulder Junction. Why the Musky Capital of the World ®? When you roll into town, you’ll see “Gill” next to the Boulder Junction Chamber Office. This 8-foot chain saw carving celebrates our status as the Musky Capital of the World ®. We have more than 50 class-A musky lakes around Boulder Junction, so this has long been a place to go after the big one. The first reference to Boulder Junction as the “Musky Capital of the World” was made by a Chicago sportswriter who fished here in the 1930s. 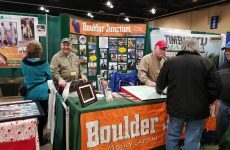 The name has been used regularly to promote the area since 1942, and the U.S. Patent Office awarded Boulder Junction the trademark to use the name in 1971. 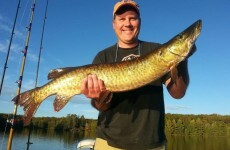 Our hometown fish is no small fry – the Wisconsin record musky weighed nearly 70 pounds and was 63.5 inches long. Check of this fun infographic to learn more about our famous fish. Looking for details on the latest fishing conditions, and where you might find the best success? 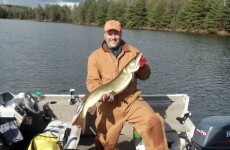 Check out our fishing reports – they are updated regularly by guide Bob Bertch, and they offer insight on gear, our lakes and what’s biting.